Martin Luther King, Jr. Elementary School Dazzles! PRINCETON, NJ; May 18, 2016 — On Saturday, April 2, Young Audiences New Jersey & Eastern Pennsylvania (YA), the area’s largest arts education non-profit, celebrated the 10th Anniversary of one of their most successful initiatives, the Trenton Adopt-A-School Program with a special black tie gala, Dazzle: Mad Hot Ballroom, Anything Goes at the Princeton Hyatt. The highlight of the evening was a very special performance by students from Trenton’s Martin Luther King, Jr. Elementary School that participated in a dance residency led by YA Master Teaching Artist, Marck “Flaco” Best, as part of the initiative. 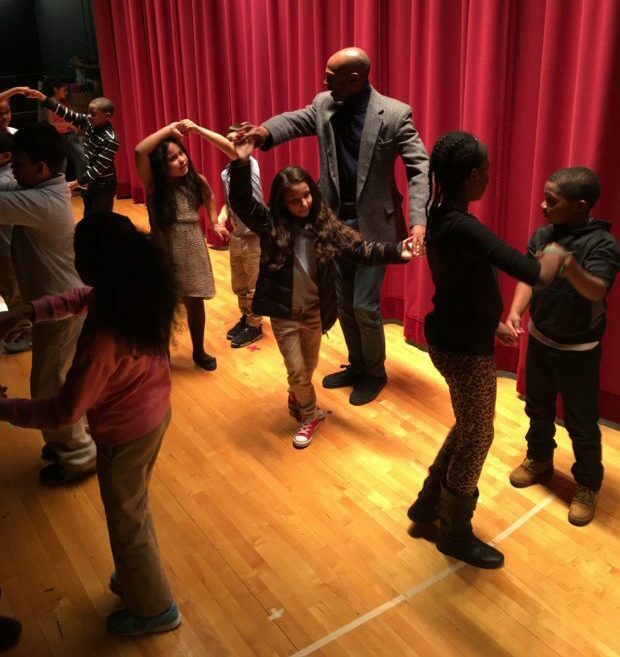 Mr. Flaco taught 40 3rd and 4th grade students from MLK School two Latin dances over 8 weeks – the Bachata and the Merengue. “Before dancing with Mr. Flaco, I never knew I could dance,” expressed a 4th grade student from MLK School that participated in Mr. Flaco’s dance residency. “The change I have seen in these students from day one until now is a complete 180,” shared Mr. Flaco. In 2006, YA launched the Trenton Adopt-A-School Program in response to the elimination of the arts in the city’s public schools. The first year four schools were served and each year since the program has grown. YA now serves every elementary and middle school in Trenton and has expanded to Ewing, Lawrence, and Camden. Generous support from corporations, foundations, and individuals, has made this success possible. In Trenton, YA annually serves 9,000 students and 150 teachers in 19 elementary and middle schools. “The arts programs strengthen academic concepts, bring a diverse perspective to learning, encourage positive choices, build character, and promote hard work and student achievement,” shared Karen Baker an Art Teacher from Village Charter School that is part of YA’s Adopt-a-School Program. 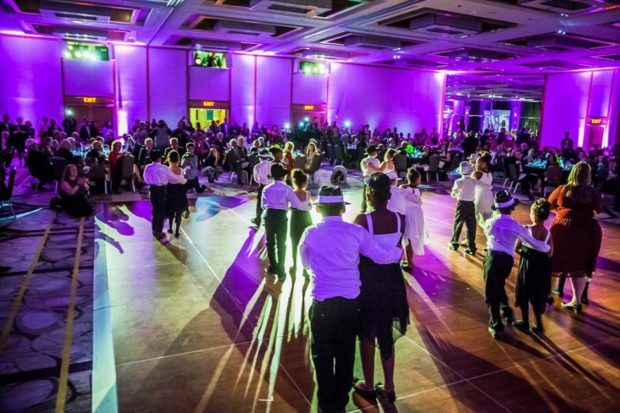 Dazzle: Mad Hot Ballroom raised over $190,000 and all donations will support YA in its mission to inspire young people and expand their learning through the arts. The generous donations included $54,450 that was raised specifically for YA’s Adopt-a-School Program in celebration of the initiatives 10th anniversary serving Trenton’s children. Performances by YA artists or groups that transform an “all -purpose” space into a performance hall, giving many students their first chance to experience a LIVE production. Hands-on art-making workshops that turn an ordinary classroom into an artist’s studio for students to connect with their personal creativity guided by a professional artist. Teaching artist-led professional development for teachers so they can learn to use the arts to teach across the curriculum. YA’s Adopt-A-School Program received support from generous sponsors, including CMX Community Foundation, Educational Testing Service, Horizon Foundation, Wachovia Foundation, Wells Fargo Foundation, Geraldine R. Dodge Foundation, PSEG, Verizon Foundation, Carley Foundation, Horizon Foundation for New Jersey, NRG Energy, Inc., Frank S. Flowers Foundation, Princeton Area Community Foundation, Bloomingdales Fund of the Macy’s Foundation, Meta A. and William S. Griffith Foundation, Morton and Donna Collins Fund of the Princeton Area Community Foundation, New Jersey Manufacturers Insurance Company, Charles Ewing Fund of The Princeton Area Community Foundation, James E. and Diane W. Burke Foundation. Martin Luther King, Jr. students engaged in a dance residency led by YA Master Teaching Artist, Marck “Flaco” Best. More photos and original video files available upon request.